Jazz Standard, located at 116 E 27th St., New York is proud to present genre-defying harpist Brandee Younger for two very special and contrasting nights of music. On Tuesday, August 21st, Younger’s electric quintet, featuring special guests Keyon Harrold on trumpet and Marcus Gilmore on drums, alongside tenor saxophonist Chelsea Baratz and bassist Rashaan Carter will take to the stage at 7:30 pm and 9:30pm. On Wednesday, August 22nd, Younger and Harrold will be joined by Anne Drummond on flute, Dezron Douglas on upright bass and EJ Strickland on drums, for two unplugged, intimate sets at (7:30pm & 9:30pm). Tuesday night tickets available here. Wednesday night tickets available here. 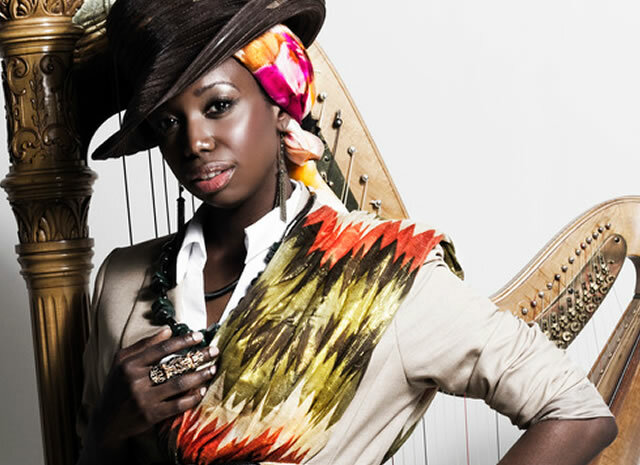 Contemporary harpist Brandee Younger is one the most in-demand and innovative musicians of her time. Of her second album as a leader, Wax & Wane (2016), Nate Chinen at The New York Times enthused, “Ms. Younger’s sleek, assured new album, luxuriates in groove.” She’s played with jazz legends like Pharoah Sanders and Jack DeJohnette as well as John Legend, Common, and Drake and is considered one of the leading harpists of her generation. Recently, Younger led a trio of harpists alongside the incomparable Moses Sumney for a stirring rendition of .his single “Quarrel”. A regular collaborator with Sumney, Younger’s haunting contributions are chronicled on a rare live performance for The Fader which is viewable here via Revive Music. In addition to her work with Sumney, Younger recently participated in “Monastic and Ecstatic: A Glimpse into the Life and Legacy of Alice Coltrane” at MOMA PS1. This 6 hour event on the life of Alice Coltrane featured presentations, performances and lectures by Brandee Younger, Ravi Coltrane, Michelle Coltrane, Ashley Kahn, Laraaji and Kelsey Lu. Across these two nights of dynamic performances, Younger is excited to be joined by two special guests: trumpeter Keyon Harrold and drummer Marcus Gilmore. Born and raised in Ferguson, MO, Keyon Harrold has shared the stage with Common – an experience which he says broadened his musical horizons beyond jazz to include funk, Afrobeat, R&B, and hip hop – Snoop Dogg, Jay Z, Beyonce, Rihanna, Eminem, Maxwell, and Anthony Hamilton. In 2009, he released his solo debut, Introducing Keyon Harrold and earned wide acclaim for his trumpet performances in Don Cheadle’s Miles Davis biopic Miles Ahead. A fellow stalwart of the New York scene, Marcus Gilmore has been included by New York Times critic Ben Ratliff in his list of “Five Drummers Whose Time is Now”. A graduate of the Fiorello H. LaGuardia High School of Music & Art and Performing Arts, Gilmore has played with an array of esteemed musicians including Pat Metheny, Vijay Iyer, Chick Corea, Steve Coleman and Chris Potter. ← OUT NOW: Saxophonist Adison Evans Releases her Sophomore Album “Meridian” TODAY!